Ranjani and Gayatri began their music career as violin duet artistes even before they reached their teens. Through their intense training, command over the violin and fine artistry, they quickly established themselves as top-class violinists of international repute. The sisters started giving vocal concerts since 1997, and within barely three years, have won high praise from discerning critics and music lovers all over the globe. Their music, imbued with a deep and abiding classicism, has been described as an exhilarating blend of vitality, melody and emotion. Endowed with strong and pliant voices, the sisters have a striking style of their own, which has won the hearts of the traditionalist and lay the rasika at once. If music is not merely to be heard and comprehended but experienced in the rapturous dimensions of the listeners’ hearts, it was provided to the hilt by Ranjani and Gayatri. Their recital breathed the eternal fragrance and the perennial freshness of Carnatic music. Born into a family deeply involved in classical music, Ranjani and Gayatri’s musical talents were discovered at a very early age. The sisters, even as toddlers, showed an uncanny capacity to grasp the subtle nuances of Carnatic music. Gayatri could identify over a hundred ragas when she was barely two and a half and Ranjani could delineate complex Ragam-Tanam-Pallavi-s when she was barely five years old. Their formal vocal training commenced under their mother, Smt.Meenakshi an accomplished Carnatic vocalist. The sisters’ first concert was for the prestigious Indian Music Group, Mumbai in 1986, at the age of thirteen and ten respectively. Through their intense training and fine artistry, they quickly established themselves as top-class violinists of international repute. The sisters achieved spectacular success as violin duet performers, and subsequently they also proved successful as most sought after violin accompanists. Both Ranjani and Gayatri have accompanied various artistes on the violin, including the legendary D.K.Pattammal, M.Balamurali Krishna, T.Vishwanathan and other popular, leading musicians of their generation. They are the recipients of the Government of India Talent Search Scholarship from the age of ten and winners of the first prize in the All India Radio National Competition for Violin. 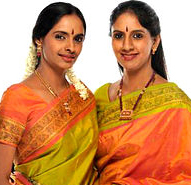 Ranjani and Gayatri shifted from Mumbai to Chennai, the Mecca of Carnatic music in the year 1993. Subsequently, they started learning from Padma Bhushan Sri.P.S.Narayanaswamy. They started giving vocal concerts since 1997 and soon won high praise from discerning critics and music lovers all over the globe. Their music, imbued with a deep and abiding classicism, has been described as an exhilarating blend of vitality, melody and emotion. Their concerts have been featured in all prominent sabhas in the December Music Festival in Chennai, and at premier institutions and prestigious festivals all over India. Ranjani and Gayatri are one of the most sought after vocalists today and their concerts are instant sell-outs. They have performed abroad widely in countries including the United States of America, Canada, Singapore, Malaysia, United Kingdom, Australia and the Middle East. Perfection of sruti, powerful voice control and impeccable aesthetics which reflect the timeless values of classicism - these are some of the qualities that describe the music of Ranjani and Gayatri. Above all this, it is the sisters’ capacity to deeply experience and enjoy what they sing, that takes their music to a different plane. Their two voices blend and contrast to strike a fine balance between vibrancy and contemplation, intellect and emotion, tradition and innovation. It is this unique combination in their music that appeals to the connoisseur and the lay listener alike. Audiences eagerly await and savour their in-depth Ragam-tanam-Pallavi-s and soul-stirring viruthams, which are special features of Ranjani Gayatri’s repertoire. They have given many thematic concerts and have an extensive repertoire consisting of gems of the Trinity, old and contemporary Tamil compositions and other languages including Sanskrit, Telugu, Kannada, Malayalam, Hindi and Marathi. The sisters are also gifted composers, who have set to music many abhangs, bhajans, and other compositions. Ranjani and Gayatri, sisters, are world renowned versatile musicians whose twenty five years of professional experience includes studio recordings, television, radio, concerts, festivals and lecture demonstrations. They have appeared as soloists, violin duos, accompanists, vocal duos, composers, educators and ambassadors of Indian Classical Music. As top class Carnatic classical musicians, Ranjani and Gayatri are conservators of their genre's unique beauty and preserve ancient tradition as they continue to innovate within it. Ranjani and Gayatri have performed widely all over India in major festivals. They have also performed abroad in countries including USA, Canada, Singapore, Malaysia, Australia, the Middle East and UK. They have given many thematic concerts and have an extensive repertoire consisting of gems of the Trinity, old and contemporary Tamil compositions and other languages including Sanskrit, Telugu, Kannada, Malayalam, Hindi and Marathi. Ranjani and Gayatri, sisters, are world renowned versatile musicians whose twenty five years of professional experience includes studio recordings, television, radio, concerts, festivals and lecture demonstrations. They have appeared as soloists, violin duos, accompanists, vocal duos, composers, educators and ambassadors of Indian Classical Music. As top class Indian classical musicians, Ranjani and Gayatri are conservators of their genre's unique beauty and preserve ancient tradition as they continue to innovate within it. They started their violin training at the age of nine and six respectively from Sangita Bhooshanam Prof. T.S. Krishnaswami at the Shanmukhananda Sangeeta Vidyalaya, Mumbai. Their musical values gained shape and direction under the watchful guidance of their father and mentor Sri.N.Balasubramanian. Ranjani and Gayatri’s musical career was launched as they barely reached their teens. Their awards include the Kalki Krishnamurthy Memorial Award awarded by the Kalki Trust, they received the title of “Sangeeta Shanmukha Mani” conferred by Shanmukhananada Fine Arts and Sangeeta Vidyalaya, Mumbai, and won the Outstanding Violinists Award for four consecutive years from the Music Academy, Chennai from 1994 to 1998. Sanskriti Award from Sanskriti Pratishtan, New Delhi (only the third carnatic musicians in thirty years to be so honoured), Title of "Isai Peroli" from the Kartik Fine Arts, Chennai, National Eminence Award from Shanmukhananda Fine Arts, Mumbai and The Kalki Krishnamurthy Memorial Award. "Title of "Isai Peroli" from the Kartik Fine Arts, Chennai.Even as toddlers, showed an uncanny capacity to grasp the subtle nuances of Carnatic music - Gayatri could identify over a hundred ragas when she was barely two and a half and Ranjani could delineate complex rhythm patterns at age five.Gave their debut performance at the prestigious Indian Music Group, Mumbai at the age of 13 and 10 respectively.Received the title of "Sangeeta Shanmukha Mani' conferred by Shanmukhananada Fine Arts and Sangeeta Vidyalaya, Mumbai in 1990.Won the Outstanding Violinists Award for four consecutive years from the Music Academy, Chennai from 1994 to 1998. Shifted from Mumbai to Chennai, the Mecca of Carnatic music in the year 1993 and started presenting vocal concerts since 1997.Their concerts at prestigious music centers including the Music Academy, Chennai, Narada Gana Sabha, Shanmukhananda Sabha, Delhi have won them several awards.